Hey there Craftwell fans, Suzanna here today to share with you an easy to create mobile! 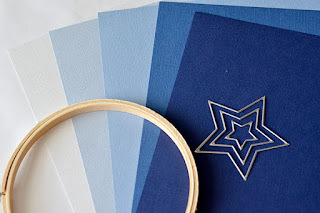 It entails little more than your Cut'N Boss, cardstock (5 monochromatic shades), staggered shaped dies, an embossing folder and some thread in your sewing machine. Using the Cut'N Boss takes a lot of the fussy work out of die cutting and embossing as you can run several things through at once as well as not have to crank the machine! Just enter the "sandwich"into the opening and let the machine do all the work for you! 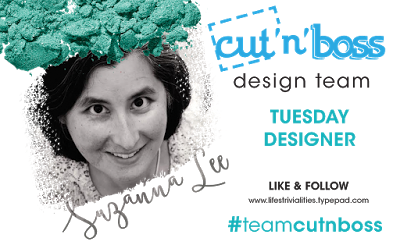 I ran A LOT of cardstock through. 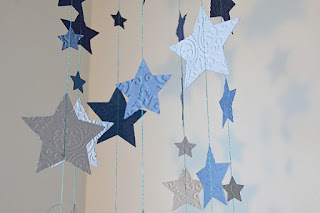 I initially thought that I would use a lot more of the stars than what my finished project has. Less is more in this case. You can't appreciate the emboss or the monochrome if there are too many strands. Using the standard die cut sandwich, run your cardstock through the Cut'N Boss and cut out various sizes and shades. I have one of each size and a random extra of each shade. I then used my sewing machine to stitch together strands of each of the 5 shades beginning with the darkest and working my way to the lightest shade (almost white). 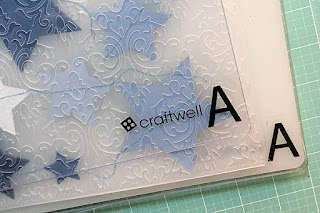 Next, put the sewn strands into your large embossing folder and run the above sandwich through the Cut'N Boss. I was able to put 3 strands through each pass thus only have to do 2 passes! 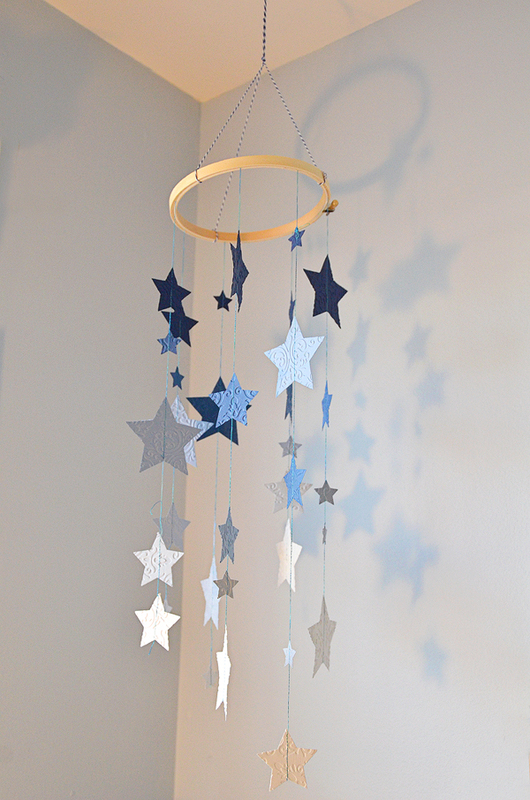 Attached your strands to your hoop, tie twine to create the hanging mechanism and enjoy! This could be a fun idea for a baby's room. I have mine hanging in my craft room. I love when the light shines and you can really see the emboss! Thanks for popping in today! If you create something from this tutorial or something similar, be sure to share it with us!